In St. Petersburg, there are many cathedrals and churches. In this article I will review the 5 most important churches or cathedrals worth visiting. 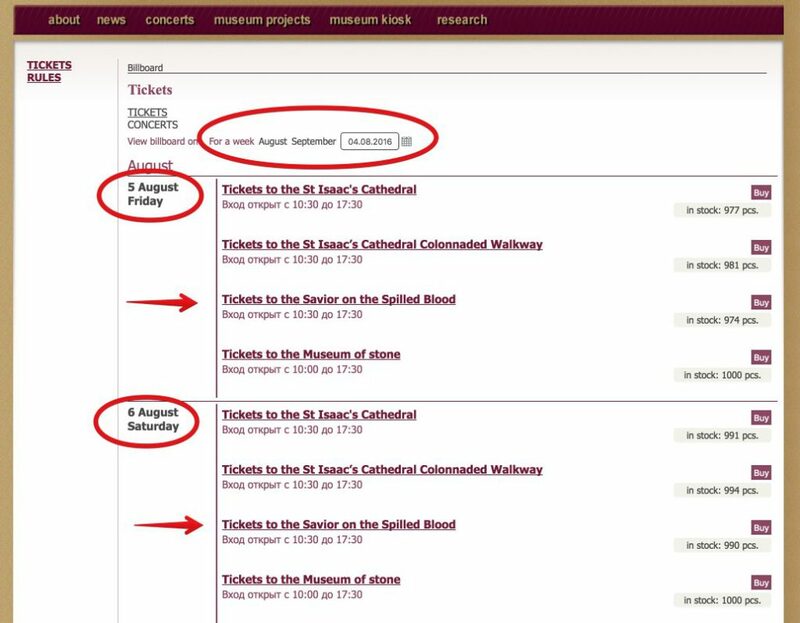 Some can be visited for free, while others are paid, so I will also explain how you can get tickets online. 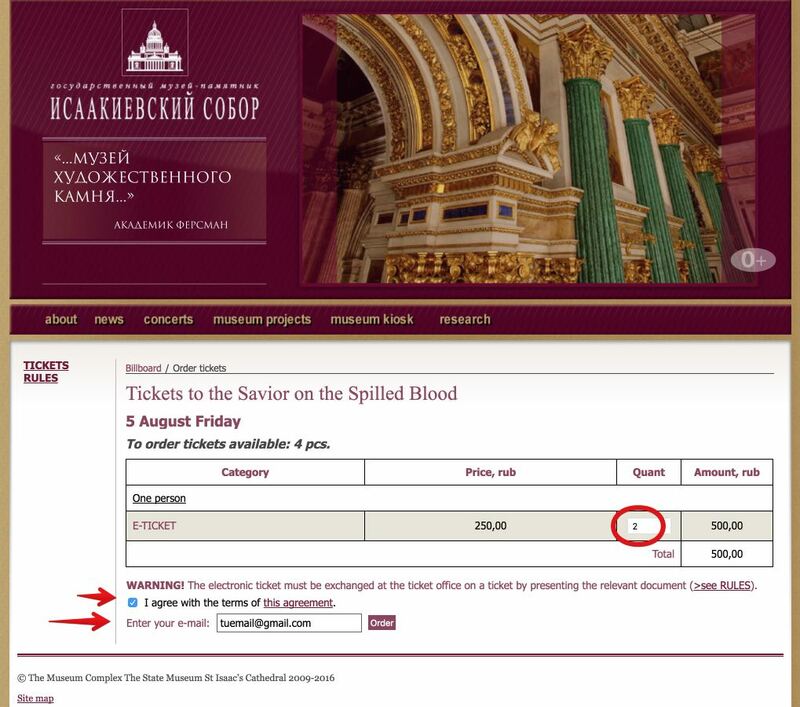 Church of the Savior on Blood (tickets cost 250 rubles and they can be purchased online). Isaac’s Cathedral (the entrance costs 250 rubles and can be purchased online). Cathedral of Our Lady of Kazan (free admission). Kronstadt Naval Cathedral (free admission). All of them are in the city’s centre, except Kronstadt Cathedral that is located on Kotlin Island (about 30 kilometers west of St. Petersburg), which can be accessed by road. The Church of the Savior on Blood (also called Church of the Resurrection of Christ) is one of the most significant churches in St. Petersburg, for its pictorial composition and multicolored decoration, a highlight in architecture of the city’s centre. It is located near Nevski Avenue, at the border of one of the canals of St. Petersburg, the Griboyedova (named in honor of Alexander Griboyedov, playwright, musician, diplomat and Russian poet of the nineteenth century). This church was built on the site where Tsar Alexander II of Russia was assassinated, following an assault on March 13th, 1881. The construction of the church began in 1883 during the reign of Alexander III (son of Alexander II) and was finished in 1907, under the reign of Nicholas II. The church was jointly designed by architect Alfred Parland and Ignat the Archimandrite. During World War II, a bomb fell on the highest dome but did not explode, and it remained like that for 19 years. When the workers went to the dome to patch some leaks, they found and removed the bomb. It was then that they decided to begin the restoration of the Church, which after 27 years, was inaugurated as a state museum where visitors can learn the history of the assassination of Alexander II. Hours: 10:00 to 18:00 (closed on Wednesdays), but from May 1 to September 30 it extends its hours until 22:30. 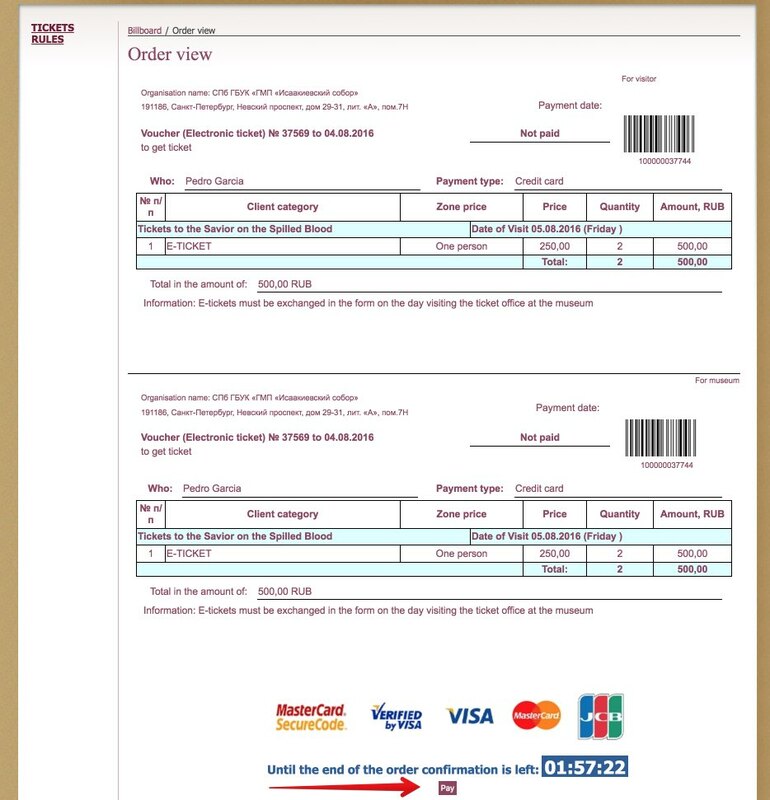 The voucher received by email must be printed and redeemed at the ticket office number 1. 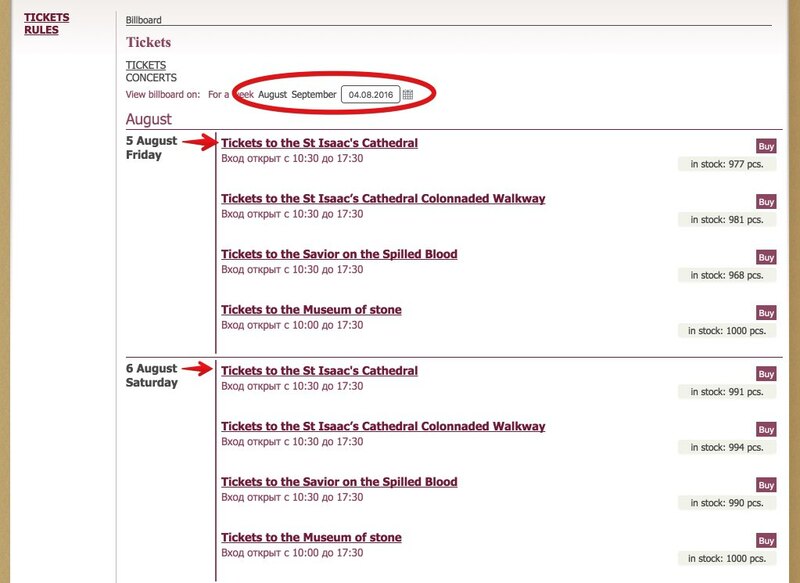 You can only buy normal priced tickets, not the reduced rate ones that can be purchased at the ticket office. St. Isaac’s Cathedral is arguably the most sumptuous and magnificent churches in the city. It began to be built on 1818 by architect Auguste Montferrand French. It should be noted that the scaffolds were made by the Spanish engineer Agustín de Betancourt and the works were finished on 1858. Over 40 different minerals were used for its decoration. The plinth was clad in granite, the walls and floors inside were clad in Russian, Italian and French marble, and the columns in malachite and lapis lazuli. In the dome of 21.8 meters in diameter, about 100 kilos of gold were used. The cathedral was adorned with 400 works including sculptures, paintings and mosaics. Since 1931, the cathedral is a museum. During World War II, the dome was painted gray to avoid attracting enemy aircrafts. You can go up to the top of the dome, where you can enjoy a spectacular view of St. Petersburg. 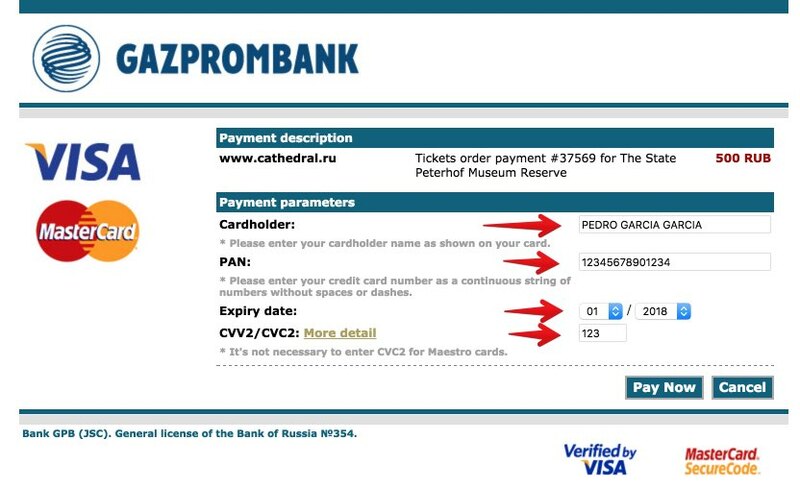 The process of buying tickets online is the same as in the Church of the Savior. 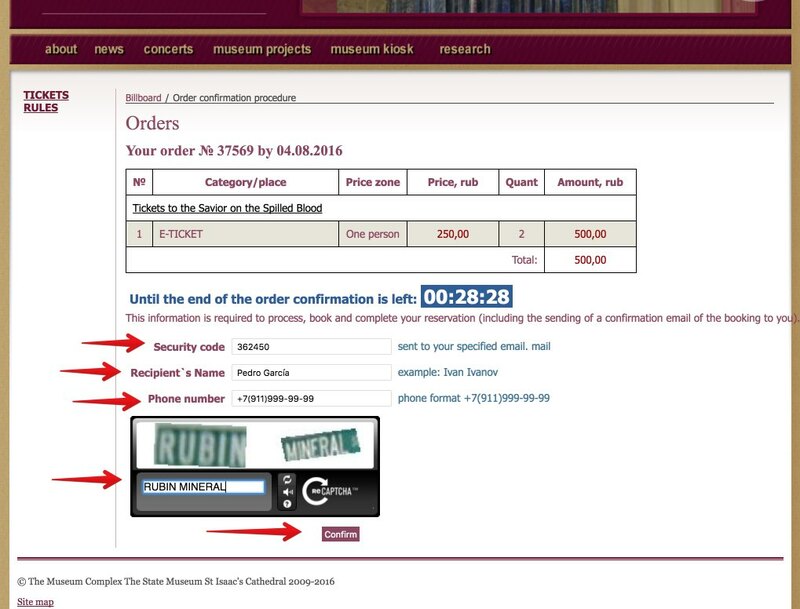 You can simply access the website to purchase them (http://isaak.ticketnet.ru/en/billboard/) and select the tickets for St. Isaac’s Cathedral. The Peter and Paul Fortress is the original citadel of St. Petersburg. It was designed by the Swiss architect Domenico Trezzini and built on 1703. The fort contains several remarkable buildings, among which the Cathedral of St. Peter and St. Paul is the highlight, where there are the remains of the czars, from Peter I the Great, to Nicholas II and his family. The fortress was ordered to be build by Peter the Great in 1703, on the small island of Zayachi, on the Neva River, though the cathedral was built between 1712 and 1733. It consists of a belfry tower of 122.5 meters high, topped with a dome with an angelfish. In 1924, most of the fortress was transformed into a museum. Following severe damage during World War II, the fort was restored. Hours: daily from 10:00 to 19:00 (on Sundays it opens at 11:00). Tickets: they can only be purchased at the ticket office. History of St Petersburg-Petrograd 1703-1918. The Kazan Cathedral is the main cathedral of the city to host the Orthodox bishop of St. Petersburg. It is dedicated to the Virgin of Kazan, the most venerated icon in Russia. Emperor Paul I ordered to build the cathedral following the model of St. Peter’s Basilica in Rome. The construction was carried out over 10 years (1801-1811), by architect Andrei Voronijin, a neoclassical structure, highlighted by the great colonnade that consists of 96 columns that end on Nevsky Avenue. Kazan Cathedral was perceived at the time as a monument to Russia’s military victories in the war against Napoleon. In 1812, the flags of the defeated armies of Napoleon were sent to this cathedral. In addition, the Field Marshal Mikhail Kutuzov is buried there. The Cathedral of Our Lady of Kazan is one of the pinnacles of Russian neoclassical architecture. After the Revolution of 1917, the cathedral was closed and was reopened in 1932 as “Museum of the History of Religion and Atheism”. In 1996, the cathedral was returned to the Russian Orthodox Church. Hours: The cathedral is open daily, from 7:00 am until after the last liturgical service takes place at 18:00. 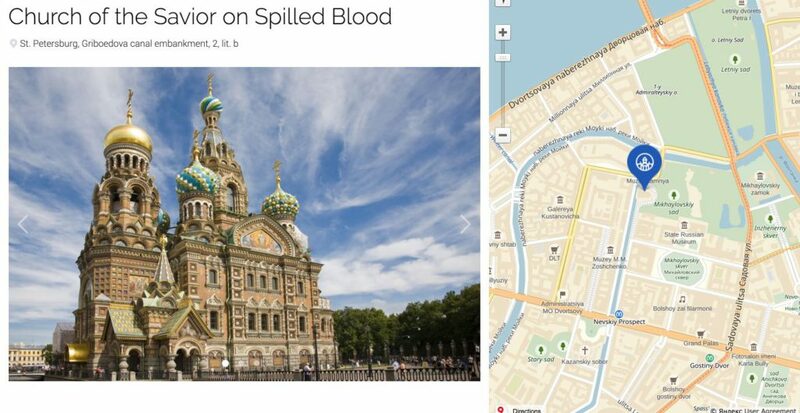 Finally, I include the Naval Cathedral of St. Nicholas in Kronstadt, a Russian port city, located on the island of Kotlin, about 30 kilometers west of St. Petersburg, from which it depends administratively. This is a newer Russian Orthodox cathedral, since it was built between 1903 and 1913, as the main temple of the Baltic Fleet, being dedicated to the fallen sailors. Of Neo-Byzantine style, it was designed by architects Vasily and Georgy Kosyakov. The cathedral is of colossal proportions with a dome that reaches about 27 meters in diameter. After the 1917 Revolution, the church was closed to worship, and became a cinema, an officers club, and even a Navy Museum in 1980. In 2013, with the assistance of Prime Minister Dimitri Medvedev, the Patriarch of the Russian Orthodox Church, and the Patriarch of Jerusalem, they held the ceremony of consecration of the restored cathedral. Hours: open daily from 10:00 to 18:00 hours. 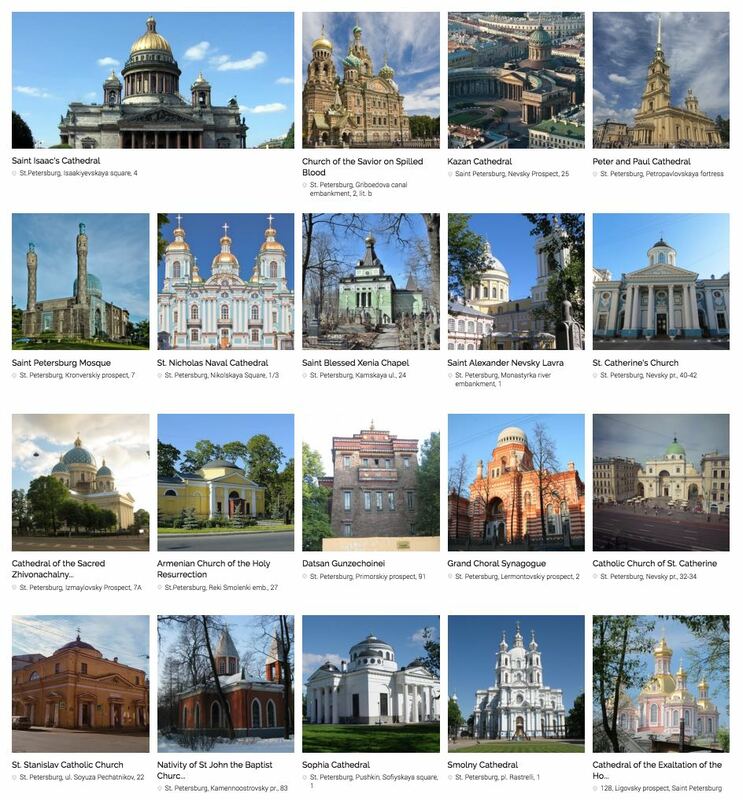 These are the 5 most important cathedrals of St. Petersburg, but you can actually visit more than 40 cathedrals and churches. If you want to know more information about them, I recommend visiting this excellent official tourist website of the city: http://www.visit-petersburg.ru/en/ (English and Russian).